Summer’s here, and well under way. We’re actually entering the last leg. Which means lots of activities, busy schedules, and some days– a break down in traditional meal times. With all of that comes snacking. Copious amounts of snacking. Anything grab and go becomes fair game as well all rush, rush, rush to squeeze every practice or memory made into those last precious few weeks. While our eating habits change somewhat out of necessity (also I’ll admit sometimes out of sheer laziness– you know the heat saps your motivation too some days), I can’t say I’m always proud of what I find us choosing to eat. Especially when it’s just for convenience sake. The sons? They’d live off of Ramen noodles, chips, and a grilled cheese every now and then if it meant they could eat and be back outside, etc, in under 5 minutes. Some days I’m ok with that. Just like we occasionally stop at McDonald’s, Chick Fil A, or even Taco Bell and enjoy a guilty pleasure breakfast or lunch. Everything in moderation, right? Even the unhealthy, heavily processed stuff. That said, with the bevy of fresh veggies readily available this time of year for free or mere pennies– I do not have an excuse for me or my boys to be going through bags of chips, snack crackers, and cookies when we’re hungry. I’ve got one son who’ll bite into fresh tomatoes off the vine like they’re apples. We all love snap peas with a little ranch or hummus, for dipping. Got fresh green beans? Try pickling them. Cucumbers? Same thing, or make an Asian Cucumber Salad. Or eat them by the slice and dip them in some plain yogurt. Still, I’ve saved our favorite snack, at home OR on the go, for last. 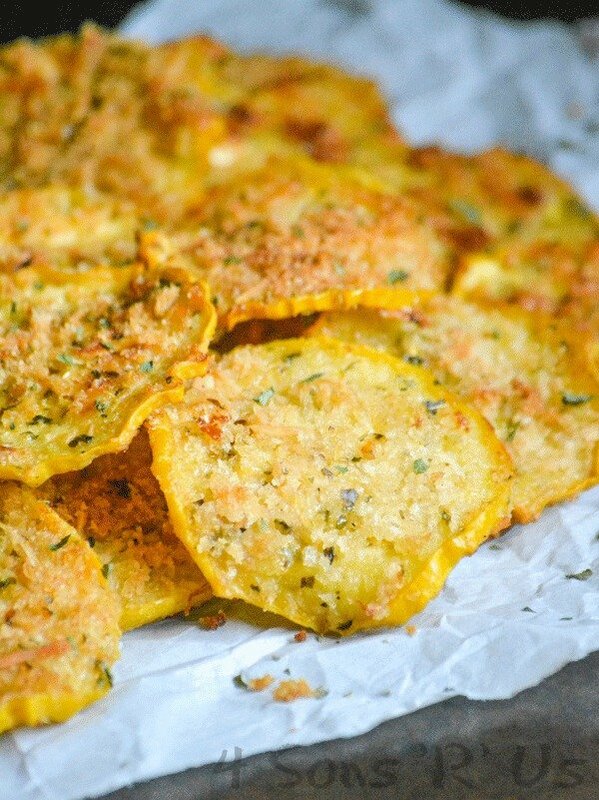 Crispy Garlic Parmesan Squash Chips. If you’ve got yellow Summer Squash, then you’ve got all you really need to make the yummiest, better-for-you ‘chip’ you’ve never heard of. 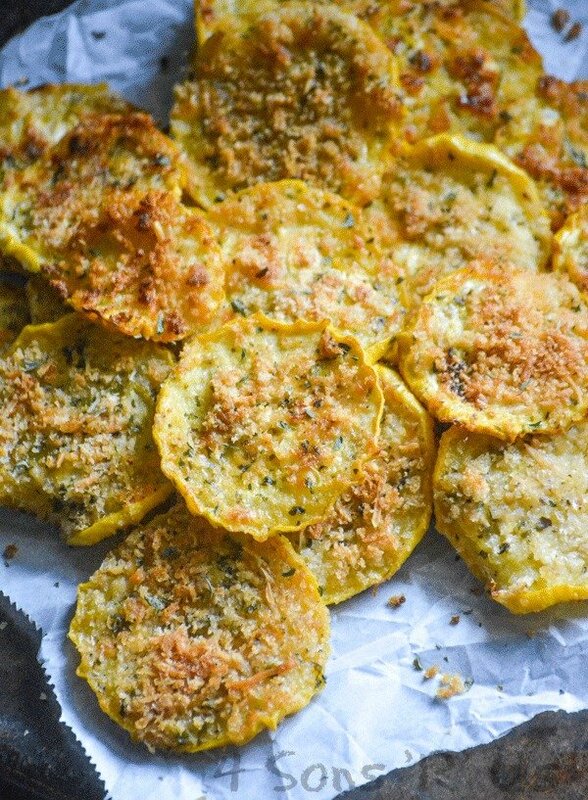 Baked instead of fried, this crispy squash chips are made from thinly sliced garden fresh squash that’s been lightly breaded and seasoned to perfection. A handful is never enough. Luckily with this snack, you can easily grab a few more without the guilt. 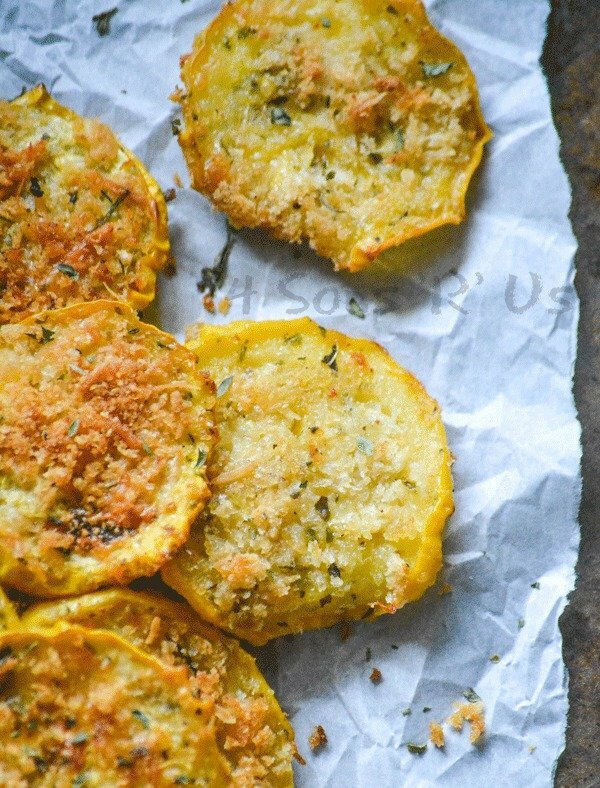 A healthier alternative to traditional potato chips, this crispy baked veggie version features fresh summer squash. Add the sliced squash to a large bowl. Drizzle with the olive oil and toss to evenly coat. Salt & pepper the squash, to taste. In another large bowl, add the bread crumbs, cheese, and spices. Toss them to evenly combine. 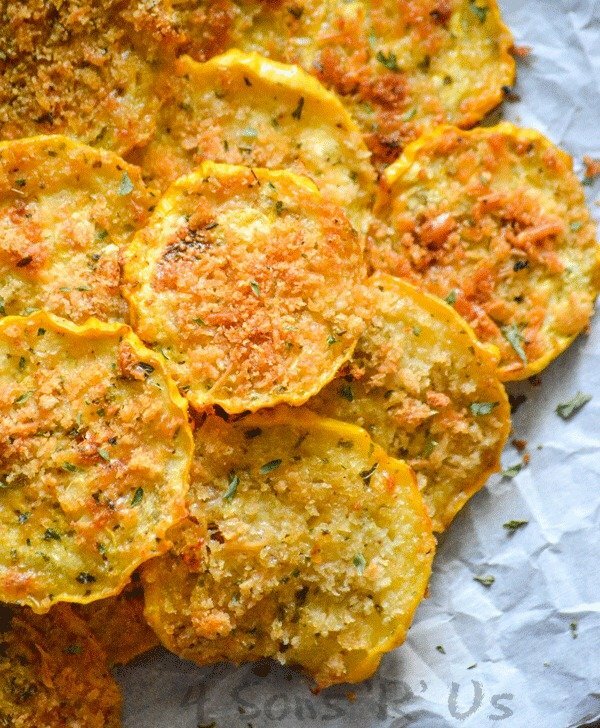 Working one at a time, dip each slice of squash into the cheese crumb coating-- use your fingers to gently press the coating onto both sides to ensure it sticks. 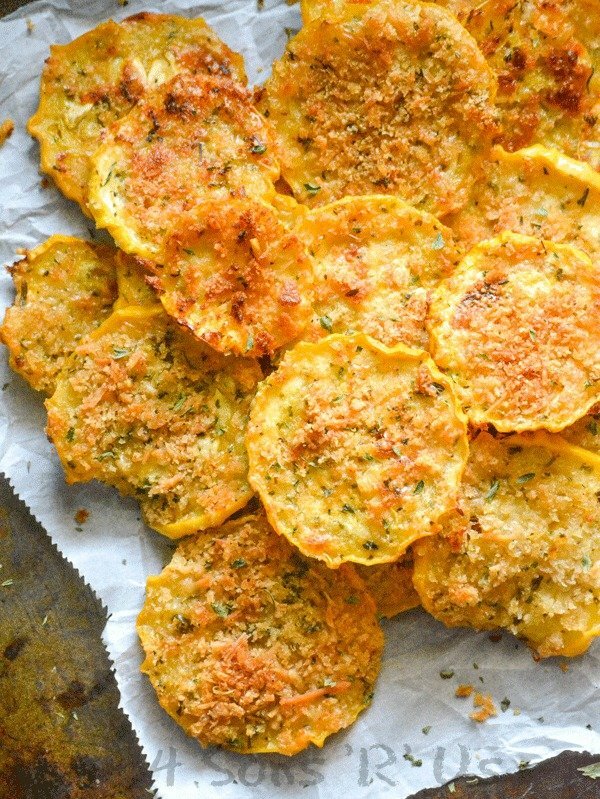 As they're coated, transfer the squash chips to a prepared baking sheet. Moving onto another when the previous one is full until all the squash is prepared. Lightly spray the tops of the chips with non stick cooking spray. Bake at 450 degrees for 10 minutes. Carefully remove the baking tray(s) from the oven. Use a fork or tongs to flip each slice over. Lightly spray the chips again with non stick cooking spray. Return the chips to the oven for an additional 8-10 minutes. Remove the cooked chips from the oven. Let them rest for 1-2 minutes, before transferring to a plate and serving. Repeat as necessary until all the chips are cooked. 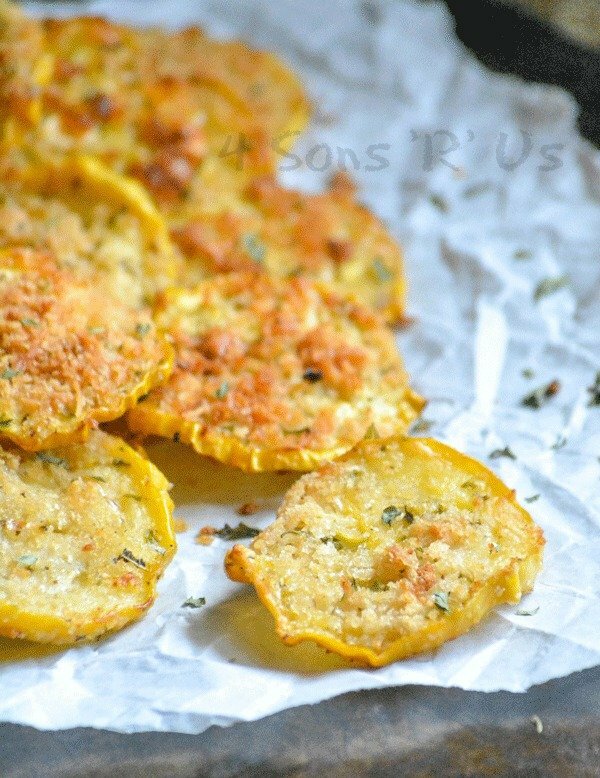 These look so good, and a great way to use all the late Summer squash! Why do you not dip them in egg to make the crumb mix stick? You could Carol, but it just wasn’t a necessary step. The crumbs bake on and stick to the chips just fine without it. Can you use almond flour instead of Pablo? Do you mean instead of the bread crumbs? If so, I wouldn’t recommend it- the flour wouldn’t crisp up when baked, just be mushy.